Zexum high quality Single Core Conduit Wiring cable. 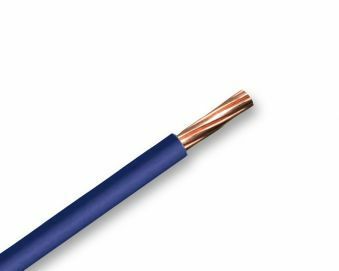 High quality stranded plain annealed copper conductors , Insulated/Sheathed with Blue PVC. Suitable for voltages up to a maximum voltage of 450V/750V and maximum current of 32A. Conforms to BS6004, BS50525 and BASEC approved. General purpose Single Core Cable suitable for use mainly in power and lighting circuits along with building wiring, Switch Gear and Control Gear. It is intended for use in exposed conduits, embedded conduits and closed installation ducts. Ideal for the internal wiring of appliances and apparatus. This product will be supplied in a single length up to 500m, unless otherwise requested.